The Boston Health Commission has listed dates and locations for flu clinics, so that members of the public can get immunizations for influenza (the flu). While the calendar does not specify whether the immunizations are for seasonal influenza (ordinary flu) or novel H1N1 influenza of swine-origin (swine flu), my impression from the dates of the clinics is that they will offer both. Wednesday, October 14th, 3-6 pm. Run by: Joseph Smith Community Health Center. Location: Gardner Pilot Academy, 30 Athol Street, Allston. Thursday, October 15th, 3-6 pm. Run by: Joseph Smith Community Health Center. Location: Jackson-Mann Community Center, 500 Cambridge Street, Allston. Thursday, October 22nd, 3-6 pm. Run by: Joseph Smith Community Health Center. Location: Gardner Pilot Academy, 30 Athol Street, Allston. Thursday, October 29th, 3-6 pm. Run by: Joseph Smith Community Health Center. Location: Jackson-Mann Community Center, 500 Cambridge Street, Allston. Boston Public Health Commission website on seasonal influenza and novel H1N1 influenza of swine-origin. UPDATE (10/21/09): Delivery of H1N1 vaccination doses has been delayed, so public flu clinics will likely be delayed until later in November. Contact the clinics themselves for more information and updated dates. Councilor Ciommo Running Reconnaissance for Mayor Menino? In Mayor Thomas Menino's escalating Delete-Delete-Gate controversy, the Boston Globe reported that the city released on Friday a set of 5,018 emails sent by, or received by, Michael Kineavy, chief of policy and planning and one of Menino's top aides. The emails appear to be those found on city backup servers that were saved by other city employees, not Kineavy; the city's forensic contractor has not yet retrieved additional emails from Kineavy's computer hard disk. Some city councilors, including Allston-Brighton District Councilor Mark Ciommo, also offered Kineavy a heads-up about separate issues that the mayor’s reelection challengers, [Councilors-At-Large] Michael F. Flaherty and Sam Yoon, were preparing to raise in council hearings. This is not particularly surprising, since "Ciommo is considered a Menino ally," according to politics reporter David Bernstein of the Boston Phoenix. Earlier this year, Councilor Ciommo ran interference with Councilor Yoon over a hearing about the Boston Redevelopment Authority's review process of Boston College's Institutional Master Plan, where Ciommo got Yoon to scale back the language of the hearing order in order to "remove politics from the discussion and focus on the BRA process," according to Ciommo. Ciommo's actions minimized the potential fallout from hearings that could have been critical of the BRA -- as well as the mayor's oversight and control of the agency. Meanwhile, the city's computer forensics contractor has estimated the cost of the email recovery work to possibly reach as high as a quarter of a million dollars. Since the recovery is the direct result of Kineavy's own failure to save his emails as he is required to do under the state's Public Records Law, will he be asked to foot the bill himself? Two schools in the Boston Public Schools system have recently been accredited in early childhood education by the National Association for the Education of Young Children, including the Winship Elementary School in Brighton. Winship joins the Baldwin Early Learning Center -- which gained accreditation in 2007 -- as the second public school in Allston-Brighton to receive this distinction. The North Zone, which contains Allston-Brighton, also boasts a third school with the accreditation -- the East Boston Early Education Center. “NAEYC is the gold standard by which all early childhood education programs are judged, and we are pleased to see so many BPS schools undertaking this rigorous process to strengthen and improve teaching and learning for our youngest students." Mayor Thomas Menino has set a goal to provide universal pre-kindergarten in the Boston Public Schools. The accreditation process evaluates the curriculum, assessment, and environment of the school against national standards. Before the polls closed, I made a series of predictions about the Allston-Brighton District 9 City Councilor race. Order of finishers. Prediction: Mark Ciommo -- Alex Selvig -- Abigail Furey -- Benjamin Narodick. Reality: same. Overall percentage of vote. Prediction: 60%-20%-18%-2%. Reality: 60%-23%-13%-3%. I predicted a closer race for second place between Selvig and Furey, but otherwise my numbers were amazingly close. Almost too close. Dumb luck? Many of the next predictions had more to do with the race between Selvig and Furey for second place. Boston College Neighbors Vote. Prediction: Furey would edge Selvig in Selvig's home precinct (ward 22, precinct 8). Reality: Wrong. Selvig took 22/8 strongly this time around with 114 votes, Ciommo second with 95, and Furey a distant third with 58. Brighton Neighbors United leaned Selvig. Elderly and Jewish Vote Leftovers. Prediction: Furey would pick up votes over Selvig in 22/9 (which includes orthodox Jewish community and more BNU) and add more scraps left over by Ciommo from the Russian Jewish elderly vote in 21/13 (Wallingford Road). Reality: yes, but only a few votes. Similarly positive results for Furey in 21/12 (Patricia White elderly apartments) and 21/16. Comm Ave Corridor. Prediction: Selvig would pick up votes along the Comm Ave corridor in ward 21 (precincts 3-9), but only a handful in these low-turnout precincts. Reality: Selvig netted 99 more votes than Furey in those eight precincts -- a dozen votes per precinct on average. Outliers: Selvig picked up most of that difference in precincts 6 and 7 (Union Square and Ringer Park neighborhoods with more longer-term residential housing stock). Oak Square and Faneuil. Prediction: Ciommo rolls over the competition picking up many votes, with Selvig and Furey splitting the scraps. Reality: Ciommo did just that in his base. The surprise was how much better Selvig did than Furey in ward 22 precincts 7 and 10 (Oak Square), 4 and 13 (outer Oak Square), and 11 and 12 (Faneuil), netting 87 votes over Furey in Oak Square, 100 votes in outer Oak Square, and another 42 in Faneuil. Furey got beat two-to-one in her home ward 22 precinct 4. North Allston. Prediction: North Allston would provide Selvig with the big boost to give him the edge over Furey. Reality: ward 22 precincts 1, 2, and 5 gave Selvig 154 more votes than Furey, a nice boost. But in looking back it was the Oak Square area that gave Selvig an even bigger boost than North Allston. Turnout. I predicted 12% turnout, but the vigorous mayoral campaign brought Allston-Brighton turnout up to 16.4% (according to my estimates). I am surprised by the higher turnout, since I expected that the voting rolls would not be fully purged of short-term young voters -- many of whom move on September 1st and thus get deleted from the voting rolls -- who registered locally for last year's presidential election. There were, in fact, 6.6% more District 9 registered voters in the 2009 preliminary municipal election than in the same election in September 2007. Left-over presidential election registered voters who don't bother with municipal elections should push the turnout numbers lower, but 16.4% turnout is significantly higher than two years ago (12.5%). That's overall a good sign for civic engagement. Incumbent Mark Ciommo yesterday sailed into a first-place win in the preliminary municipal election for Allston-Brighton District 9 City Councilor. But challenger Alex Selvig outspent him by nearly three-to-one in the cost-per-vote metric. Selvig's expenditure of more than $26 per vote cast for him puts him in the same ballpark as mayoral candidate Michael Flaherty and incumbent Mayor Thomas Menino. Ciommo took 3,493 votes compared to second-place Selvig's 1,353, third-place Abigail Furey's 784, and fourth-place Benjamin Narodick's 188. Of course, none of this money was directly handed to voters in exchange for their votes. The big expenditures were primarily mailings, polling, phone banking, consulting and staffing, get-out-the-vote efforts, and so on. There were some significant expenditures in the last couple of weeks -- i.e., bulk mailings -- that have not yet been accounted for in the campaign finance reports to date, so this estimate of cost-per-vote will be revised upwards next month upon receipt of the new reports. The A-B District 9 City Councilor expenditures compare to the city-wide costs of $26, $25, $17, and $4 per vote for mayoral candidates Flaherty, Menino, Sam Yoon, and Kevin McCrea, respectively. Image of "Day 4 - Paying off debt" by quaziefoto provided through a Creative Commons license. Word from the 27 precincts in District 9 City Councilor race that Mark Ciommo has won the preliminary municipal election with 60% of the vote and will face Alex Selvig, who got 23% of the vote. Abigail Furey finished a more distant third with 13%, and Narodick had the remainder few percent. UPDATE (10:28 pm): Yep, 60-23-13-3% for Ciommo-Selvig-Furey-Narodick (plus round-off error and 0.4% write-in). 5843 votes cast. I'm estimating around 12.6% turnout of registered voters. In a re-election bid by a candidate with broad name recognition and long-time ties to the community, Mark Ciommo should have little difficulty taking first place in today's preliminary municipal election. The main story, however, I am predicting to be that he will only exceed 50% of the votes by a little bit, thereby guaranteeing that he will have to work hard in the next six weeks until the municipal election in order to get re-elected. The second story is that second place is really too-close-to-call between challengers Alex Selvig and Abigail Furey. 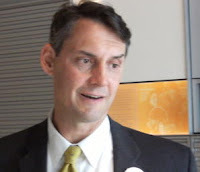 Ciommo was first elected in 2007 against Greg Glennon, an opponent who nonetheless got 40% of the vote despite alienating many in the neighborhood with his politically moderate views, lack of civic engagement in the community, modest financial resources, and a campaign that was awful in answering their phones or emails. Ciommo's two main opponents in 2009 -- Selvig and Furey -- are unlikely to have Glennon's former boss, former state Representative Brian Golden, pulling all those strings behind the scenes. But I sense a significant level of discontent among some voters this time around in Ciommo's record during the past two years. Selvig and Furey are both motivated, in part, by what they perceive to be Ciommo's too-friendly relationship with Boston College and its campus expansion review process. Selvig has better managed to expand his general criticism of how the city is run -- and, by association, the city councilor -- to issues beyond BC, such as rodents and absentee landlords. The race for second place is really too close to call between Selvig and Furey. Selvig had problems in his own Ward 22, Precinct 8 in 2007, when he won the plurality -- but only with around 1/4 of the vote. Expect Furey to give him a run-for-his-money, edging him out. Furey should start racking up numbers next door in the Rabbi's 22/9 precinct, and make some small but significant gains at Wallingford Road's 21/13 precinct with the Russian Jewish community (at least the minority of votes Ciommo doesn't command). Selvig can be expected to pick up gains over Furey along the Commonwealth Avenue corridor of Ward 21, but, as Tim Schofield showed two years ago, those votes are typically so few that Selvig needs to pick up more. Ciommo will likely again dominate the Oak Square and Faneuil neighborhoods, piling up the numbers and just leaving scraps for Selvig and Furey to split. The second-place race will probably be decided instead in North Allston. Selvig set up campaign shop there this time around, and has been knocking on doors like crazy -- including Charlesview, whose relocation is a major issue in this election. I think Selvig will pick up the rodent vote in North Allston and North Brighton -- those who were impacted and outraged by the outflux of rats in the past year, likely due to Harvard's Science Complex construction work -- and this will give him the overall edge for second place over Furey. Third-year BU law student Ben Narodick, showed himself to be poised, well-spoken, and boned-up on local issues -- at least as much as you could expect a relative newcomer to the neighborhood to be. But people new to local politics, without any broad organizational support, usually get little more than 100 votes in this kind of election. I'm predicting that the District 9 result will be similar to the mayoral one: two challengers will duke it out in a close race for second place; and the incumbent will take a strong first place, but get a share of the vote close enough to 50% that the story for the next six weeks will be his potential vulnerability in the November election and the continued vibrant campaign. Turnout prediction: 12% in Allston-Brighton. These directions usually originate from the precinct boss, Ukrainian-born Naakh Vysoky, and indicate for whom the many elderly residents of the senior housing should vote. A sample ballot for the precinct -- in Russian and filled out with the names of these candidates filled-in -- was obtained from an elderly voter and is shown here [right]. These voting directions normally move up to 500 votes for the favored candidates in the elderly Russian Jewish community in that heavy-voting precinct. In the 2007 District 9 race, Greg Glennon carried 21/13 in the preliminary, but Mark Ciommo was able to work the vote hard to win the precinct in the final. This year, it appears that Ciommo has a clear edge to rack up these votes. Given Mayor Menino's influence in that community, and Councilor Ciommo's experience as former director of the Veronica Smith Senior Center, it is not surprising that they are on the voting directions. Councilors-At-Large Connolly and Murphy are not so surprising, either, given their incumbency status. But why is Felix Arroy Jr., the son of former Councilor-At-Large Felix Arroyo, also getting their vote? I haven't figure out the answer to that one yet. On September 22, elections will be held in our city, and we ask you to show your support for the candidates involved with our community. You may address them if you need any help. Please mark in the bulletin the names printed in bold. The Boston Globe made no endorsement in the Allston-Brighton District 9 race for this preliminary municipal election. The odd thing was that they made an oblique reference to there only being "nominal" opposition in the district city council elections (other than District 7), yet also did not endorse the incumbent. I was at both District 9 candidates forums last week, where challengers and the incumbent all made good cases for their election. Saying that there was only "nominal" opposition is a mis-characterization of the race. Image of Muppet Beer Glasses by gashale provided through a Creative Commons license. See this post, which I've tried to keep updated with information. Looks like Brighton's WGBH is buying the all-classical commercial radio station WCRB. And plans to turn it into an all-classical non-commercial radio station. Wahoo! No more repeated advertisements for the "Brain Injury Institute" broadcast during Saturday morning "Kid's Classical Hour." And I won't have to answer the question, "Dad, what's a brain injury?" For people who read the Boston Globe online, they often miss out little sidebar text that contain nuggets of useful information. Metro Editor Brian McGrory has already admitted that he could hardly care less about the Boston City Council. But at least his guys at the Globe should get their facts straight on the rare occasion that they show a little bit of interest in the city council. When and where will the Globe's correction run? My prediction: nowhere. The Allston-Brighton Day Parade today, and the Brian Honan 5-K race before it, were a lot of fun to watch and cheer on the participants. My daughter and I banged various noise-makers for the runners, many of whom seemed to appreciate the cacophony. Several years ago state Representative Michael Moran stepped up his involvement in the parade in order to prevent its possible demise. He also hosted a barbecue at the Oak Square YMCA afterwards, primarily for the parade participants. If you think organizing a parade is a lot of work, think about how else Rep. Moran has been in the news of late: he is the state representative chair for the state legislature's Joint Committee on Election Laws. His committee recently voted out a new law allowing a gubernatorial appointment to fill temporarily a vacancy in the U. S. Senate caused by the death of former Senator Edward Kennedy; the full House of Representatives passed the legislation on Thursday. When I spoke with him briefly during the parade, he looked tired but pumped up. It must have been an exhausting week. Major new legislation plus organizing a parade: effective multi-tasking coming out of Rep. Moran's office. The Allston-Brighton Day Parade normally occurs one or two weekends before the fall primaries or preliminary municipal election. Sure, crowd-wise this parade is nothing compared to the St. Patrick's Day Parade in South Boston. But the timing has, in recent years, made it a popular event for political hopefuls to attend a public event and gain publicity before the A-B voters. This year was no different -- except for a surprising number of no-shows, particularly among the candidates for councilor-at-large. Little did they know that we in A-B would be taking attendance -- and broadcasting it on the intertubes. You know, if Mayor Thomas Menino himself thinks a parade important enough to show up, then it is probably important enough for a councilor-at-large wannabe, too. 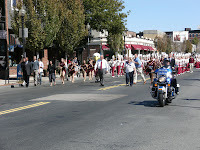 [right] Mayor Menino, his wife, and state Representative Michael Moran lead the parade ahead of the Boston College Marching Band. McCrea as a no-show is not too surprising. He's running a gadfly-like insurgency campaign, not following conventional wisdom in his unconventional campaign. His anti-BRA message had the potential to resonate with A-B voters bothered by the issue of institutional expansion, but he doesn't appear to have been spending much time in the district and spent the afternoon at the Allston Village Street Fair and Moran's barbecue. Narodick's absence is not surprising, since he is running a very-low expense campaign that probably couldn't afford the parade entrance fee given the Rosh Hashanah holiday season. But Selvig's absence is very surprising because of family commitments (attending a nephew's birthday). Two years ago he ran the 5-K race and then marched in the parade. Most surprising was Connolly's absence as an incumbent in the race. He has been seen periodically in the last two years at community meetings in A-B, so we know that he's not ignoring the district. He has a politically-savvy team, however, and may have calculated that he would get better exposure elsewhere. On the other hand, could Connolly's no-show have something to do with an imminent bundle-of-joy? Update: Connolly's team tells me that he was, in fact, in the parade. He had no banner, only a small group, was marching out-of-order (nearer the front), and I obviously missed him. Sorry! Another surprising move is the absence of Nguyen, since A-B has a substantial Asian-American population -- not just Chinese-American, but a growing number of Vietnamese-Americans, too. The bottom six candidates in cash-in-hand as of the end of August were all among the ten no-shows in the A-B parade. That can't be a coincidence, suggesting that a parade entrance fee (and the effort/expense of organizing people to attend) was considered by many of them to be a poor use of limited resources. But Felix Arroyo, Jr., is wallowing in cash -- and his father attended the parade back in 2007 -- so his absence is hard to explain. Galen Mook took video of Thursday night's candidates forum for the District 9 City Councilor race, and has now posted it to vimeo in two parts. I would like to thank Galen for taking the initiative by volunteering to take the video and put it online. Contributions like his are valuable additions to the civic discourse in our city by providing voters, who might not have been able to make the event, the information on the candidates so that they can make an informed choice at next Tuesday's election. I will, of course, try to twist Galen's arm again to take video of our next candidates forum in Allston-Brighton, which is tentatively set for Wednesday, October 14th with the eight remaining candidates for City Councilor-At-Large. Allston-Brighton District 9 City Council Candidates Forum, 9/17/09, Part 1 from Galen Mook on Vimeo. Allston-Brighton District 9 City Council Candidates Forum, 9/17/09, Part 2 from Galen Mook on Vimeo. At Tuesday night's candidates forum, and several times at Thursday night's candidates forum, challenger Alex Selvig repeated his request that incumbent District 9 City Councilor Mark Ciommo release all his emails to or from Michael Kineavy, Mayor Thomas Menino's chief of policy and planning, who is involved in the Delete-Delete-Gate scandal. On both counts, these two challengers over-reached. And in saying that constituent service work would be compromised by having to provide the documents, Ciommo over-reached, too. Ciommo noted, however, that he has approximately 8,500 emails on his computer, such that the process of delivering the public records may take some time -- presumably for he and his staff to search for the records, and then review them. That explanation didn't satisfy Selvig -- who twice criticized the time estimate by arguing that the computer search should only take 30 seconds. But Selvig missed entirely the potentially labor-intensive side of responding to a public records request: inspecting the individual documents in order to determine if each one should be withheld due to legal exemptions to the disclosure requirements of the Public Records Law; and possibly redacting specific parts of each document when that text should not legally be released under the PRL. The Secretary's Guide identifies the exemptions to public records disclosure -- 18 exemptions listed in the law as (a) through (s) [(k) has been repealed]. The exemptions range from redacting specific kinds of personal information to non-disclosure of documents that might jeopardize public safety. Most of the exemptions are highly unlikely to apply here. But the privacy exemption (c) may require redactions in some emails, and the deliberative process exemption regarding developing policy (d) could require withholding some documents. (Kineavy's job, after all, is chief of policy and planning.) If Ciommo chooses to invoke (d) to refuse to release any document, however, he must provide a full explanation of it -- such as provide the time/date/to/from/cc/subject for each individual document along with a brief explanation of why it is being withheld. And Ciommo has 10 days from the receipt of the request for public documents to provide his response -- which might not be the documents themselves, but instead a description of the work effort (and possibly the estimated cost) required to provide the documents. I suspect that Ciommo will read the writing on the walls and waive any costs related to the work as well as minimize -- if not avoid altogether -- invoking the deliberative process exemption (d). The public interest is rarely served when a legitimate request for public information is withheld pending a substantial fee, or when its release is delayed inappropriately. Selvig over-reached by disbelieving the possibility that Ciommo's time estimate might be reasonable -- yes, it might actually be reasonable -- and Furey over-reached by saying that Ciommo "shouldn't be... deciding what to release and what not to release," because he has those rights and responsibilities as specified under the law itself. And Ciommo's claim that constituent service work might be compromised by the time it takes to respond to a public records request? Here Ciommo over-reached, too. He and his staff are paid by the public to do both constituent service work and respond to public records requests. If his office can't do both at the same time, then he is giving his opponents on a silver platter a reason that he should not be re-elected. It must be emphasized that there is a substantial public interest in Kineavy's emails: recovering documents that appear to have been inappropriately deleted; providing documents responsive to a federal investigation into former state Senator Dianne Wilkerson; and providing documents responsive to challenger Abigail Furey's request, as part of the civic organization Brighton Neighbors United, into the process by which the Boston Redevelopment Authority reviewed and approved Boston College's Institutional Master Plan. There is little question that Ciommo's office should release these documents, it's really only a question of how, when, and exactly what. Let's hope that cooler heads prevail so that the public interest can be served. Image derived from [redacted] by stallio, provided through a Creative Commons license. At Thursday night's candidates forum for the Allston-Brighton District 9 City Councilor race, challenger Abigail Furey took her seat and opened her file folder with her notes. And realized that the page with her closing remarks wasn't there. Furey called her Campaign Coordinator Katie Bassler aside and told her the problem. Bassler knew what to do: grab Furey's bag; rifle through looking for keys; hop into Furey's car; learn to drive the standard transmission on the way to Furey's house; search the house for the missing papers; and return to the forum. And she got the papers back in plenty of time for the closing statements. Bassler's no rookie of solving last-minute snafus: she worked in 2007-8 as Grassroots Outreach Coordinator for the failed presidential bid of now-Secretary of State Hillary Clinton. Bassler isn't the only Hillary Clinton connection for Furey: a campaign donor of Furey's, Patti Solis Doyle, was Clinton's campaign manager and happens to be married to a cousin of Furey. After all's said and done, I hope Furey's clutch still works. Image of Furey in a less-stressed state of mind at Tuesday night's meet-and-greet. The new bicycle lanes on Beacon Street are finished: stripe painting and stenciling. Sean Roche at the Newton Streets and Sidewalks Blog has images of the lanes, including where the westbound lanes end abruptly at the border with Newton. The ball's in your court now, Newton! No, I did not live-blog, live-tweet, or video-tape the Allston-Brighton District 9 City Councilor Candidates Forum Thursday night.. But three other people did. Harry Mattison (of the Allston Brighton Community Blog) joined the twitter crowd and tweeted extensively (@harrymattison) throughout the event. For those unfamiliar with twitter, the first message he posted will appear at the bottom, so you have to read it from bottom to top. Mattison uses acronyms for the candidates: MC (Mark Ciommo), AF (Abigail Furey), BN (Ben Narodick), and AS (Alex Selvig). And Adam Gaffin [right] (of the Universal Hub blog / aggregator) wrote a live-blog of the event -- but, since there was no wifi signal inside the venue, he had to wait to upload the whole thing as a single post to his blog. He also wrote a story, "Councilor Ciommo has an email problem." And finally, Galen Mook was taking video of the entire event with some serious equipment. He expects to post the video, split into a few pieces, online in a few days so that I can link to and/or embed it here. Thanks to those three gentleman, we have a nearly instant record of the candidates forum that can help voters, who were not able to attend the event, learn where the candidates stand on a series of issues facing the city and the Allston-Brighton neighborhood. I hope everyone gets out to vote on Tuesday, September 22nd for the preliminary municipal election. Image of Adam Gaffin by Alison Klein cribbed from the Weekly Dig without permission. Why Does Doug Bennett Like Me So Much? I've been getting my fair share of calls in the last few weeks from many of the 15 candidates for city councilor-at-large and the four candidates for mayor. For some reason, councilor-at-large candidate Doug Bennett keeps calling more than anybody else. What is it about my voter profile that is attracting his attention? He was class valedictorian at Valley Forge Military College and was in the Army reserve. Me? Peace Corps. Can't be it. He served as a Selectman on Nantucket. I've yet to visit there. He rushed the field at a Penn State football game and got arrested. The closest I can claim is that I've possibly thought about offering bribes to West African government employees, but never got arrested while possibly thinking about it. Maybe it's that I'm an unenrolled voter who votes in every municipal election? Probably more like it. I suspect Bennett has identified unenrolled frequent voters as his target audience. The preliminary municipal election is scheduled for Tuesday, September 22nd. Polls open at 7 am and close at 8 pm. The Allston-Brighton District 9 City Councilor race is being contested with four candidates; the two top vote-getters will face off during the November municipal election. Four City Councilors-At-Large, where incumbents John Connolly and Stephen Murphy face 13 challengers, with the top eight vote-getters moving on to the November municipal election. The first candidates forum (9/15/09 at WGBH) is summarized here. Second candidates forum (9/17/09 at Elks) is summarized here and tweeted here. Emails discussed here and here. Online video is here (alternatively, the same video content is here). The Boston Herald continues its tradition of not covering the District 9 City Council race as well as virtually ignoring all Allston-Brighton neighborhood issues -- unless they can put a picture of a Harvard rat on the front page. Selvig, letter, Allston-Brighton TAB, 8/20/09, "Why the 10-year wait for commuter rail service?" Ciommo, letter, Allston-Brighton TAB, 5/22/09, "Allston-Brighton's city councilor, Mark Ciommo, supports 5-zone plan for Boston Public Schools"
Furey, letter, Boston Globe, 1/4/09, "New BC dorm would be in heart of a residential neighborhood"
All the blog posts can also be found by using the "election2009" tag here at Brighton Centered. 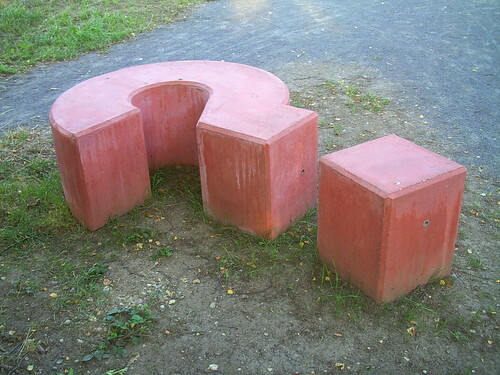 Image of question mark in Esbjerg by alexanderdrachman provided through a Creative Commons license. The first of this week's two candidates forum for the Allston-Brighton District 9 City Councilor race took place Tuesday night at the WGBH auditorium in Brighton. Two years ago, challenger Alex Selvig walked the streets of A-B knocking on doors while hanging a pair of boxing gloves over his shoulder. This year, Selvig hung up those gloves, but came after incumbent Mark Ciommo with a few well-placed jabs. While a few punches -- body blows -- were landed by Selvig and the other two challengers against Ciommo tonight, none of the them drew blood. The questions -- ranging from trash and rodents to schools and federal money -- were submitted and prepared by members of the Allston-Brighton business community sponsors of the event, and read to the candidates by moderator state Senator Steve Tolman. Everyone agreed on a few issues: rats are bad and everywhere; the schools need improvement; and that commuter rail trains should stop somewhere in the neighborhood. The next candidates forum is Thursday night at 6:30 pm at the Brighton Elks Lodge (326 Washington Street). Incumbent Ciommo [right] was ready from the start with examples of his record from the past two years: a "Fight the Blight" program to clean up the streetscape; working with EMS to improve A-B ambulance response times; working with ISD and IT to create an internal database of landlord names for every property; voting against the meals tax (because we compete with other neighboring communities for restaurant business) but for the hotel tax; chairing the Ways and Means Committee during a deep recession year. He also mentioned a couple of issues on which his involvement might be considered a bit more of a stretch: improvements to Commonwealth Avenue (a state project in the works for many years); delivery of 65-gallon recycling barrels next month (a city-wide program associated with Mayor Thomas Menino). And there was also an accomplishment he claimed that I, frankly, didn't understand: creating a "partnership with ISD" to deal with the rat problem in A-B. "Every two years we have a referendum on the direction of the city," opened Furey [left], noting that the neighborhood now has increasing problems with rodents, closed store fronts, and dirtier streets in some neighborhoods. "As a constituent," she also said, there are "a number of cases where resident voices are not being heard." Selvig pointed out that Ciommo's budget, as chair of the Ways and Means Committee, cut money for shelters by 8% at a time during the recession when they are most needed. And the city's budget doesn't fully fund the new recycling bin program that is being rolled out. Fund them instead with the $2 million currently used to maintain fire call boxes, he said, echoing Sam Yoon's mayoral campaign issue. Challenger Benjamin Narodick [right], a 3rd year law student at Boston University, called Ciommo's database a "start," not a solution. While all four agreed that the neighborhood should get at least one commuter rail station built, there were a few distinctions. Ciommo expressed it as, "We need a commuter rail stop now," Selvig called the project "shovel ready" and a "perfect project to qualify for federal stimulus funds," while Narodick said that he would make it a top priority if elected. We were in the WGBH auditorium, after all, so it is not surprising that Ciommo would point out that he favors the nearby Brighton Landing site on Everett Street. Furey struck out with a different issue: the plan from the state's Executive Office of Transportation doesn't address how commuters will travel to-and-from any new commuter rail station. She called for the EOT to integrate local transit options into the commuter rail plan. Before the meeting I spoke with a WGBH employee who made that exact same point. When responding to the question, "What should be done about the BRA? ", Narodick said that the City Council "should use the power of the purse" to rein in the agency. Ummmm... the whole issue, according to critics of the BRA, is that the City Council has basically no oversight or control over the agency or its budget -- they can't even stop the BRA from taking over city property for its own use through eminent domain. That is why some people think there should be a planning department in the city, because it would be subject to greater City Council control than the BRA currently is. The candidates were united in their concern for the quality of the public schools, noting it as an issue that discourages families from moving into the neighborhood. Beyond that, only a few concrete solutions were offered. On charter schools, Narodick [right] stood out as opposing charter schools under the principle that they create a two-class system of education; Furey opposed new ones in A-B since we already have charter and pilot schools here, instead arguing that opening new schools would further weaken the neighborhood. Selvig and Ciommo appear supportive of a school zone restructuring plan which would make Allston-Brighton into its own zone. Selvig, who vowed to send his infant son to the public schools (when he is older), said that he didn't want kids to be sent on long daily bus trips to East Boston. Ciommo made the argument over re-zoning as one of saving money. Furey bought none of this, pointing out that A-B already has schools that are currently under-enrolled with kids who live in the neighborhood. "We should be focused on stabilizing our neighborhood" instead of following the proposed re-zoning plan, she said. Narodick also wanted to address the dropout rate by encouraging students to "get on the bus" in the morning with sports, music, arts, and after school events. Selvig put forward his idea to brand one or more main streets sections of the neighborhood (e.g., Allston Village) as destinations -- marketing them for nightlife, particular kinds of shopping, or unique character. I thought I could see some heads nodding in approval from the business interest sponsors of the forum. But then he said that parts of Allston-Brighton remind him somewhat of San Francisco's Haight-Ashbury district. Maybe Haight-Ashbury without all the bookstores. Or the stoned guys on the street. Or the other stuff. BU student Narodick offered a different perspective from the other candidates on the issue of institutional expansion. "You can't be blaming universities for student problems," he said, "or blaming students for institutional expansion." None of the others challenged him on these points, however. Ciommo probably raised the eyebrows among his two challengers who are founding members of Brighton Neighbors United when he responded to a question about improving the relations between A-B and the universities by saying that "you have to make a decision of what is in the best interests of our community while also letting the university expand." Several challengers raised the problem that the city's ISD is not doing sufficient inspections of improper trash storage, rodents, and substandard rental housing issues. The few rental units that are being inspected aren't the problem, said Furey, it's the ones that aren't. She noted how certain neighborhoods, particularly Allston Village, are having increasing problems with trash. Narodick argued for a 5-mile rule: landlords who live more than five miles away would be required to have a registered agent on-site to maintain the property on a regular basis. Furey and Narodick agreed on instituting twice-weekly trash pickup for certain neighborhoods where the trash piles up quickly, such as Allston Village. After earlier apologizing for putting a rat in everyone's mailbox, Selvig [left] suggested setting the fine for improper storage of trash (i.e., no trash barrel, one overflowing, or without a lid) to be the cost of delivering a new trash barrel with a lid to the property owner. On top of that, Selvig charged that the "laws on the books" (such as inspections of rental housing whenever the lease turns over, and the Four and No More law) "are not being enforced at all." Sounding like this criticism struck a tender spot, Ciommo retorted, "I don't want to live in a world where we send out an army of inspectors to inspect each home." The recent email Delete-Delete-Gate scandal in city hall figured into the proceedings near the end. Furey noted that she was part of a state Public Records Law request that she now realizes the city did not fully respond to because many of the requested emails were deliberately deleted by city officials. Selvig concluded by calling on Ciommo to release copies of all of Ciommo's emails that were sent to -- and presumably received from -- Michael Kineavy, chief of policy and planning for Mayor Thomas Menino. Ciommo didn't respond to Selvig's call, but I bet we haven't heard the last of this one from the candidates. I recently predicted that Congressman Stephen Lynch would win the Democratic nomination to replace Edward Kennedy's seat on the U.S. Senate. I was wrong. The Democratic side of the race is now looking mostly like a two-way between Massachusetts Attorney General Martha Coakley and Congressman Michael Capuano (whose district includes Allston-Brighton). The first candidates forum will be held Tuesday night at 5:30 pm at the WGBH headquarters at 1 Guest Street, Brighton. It is sponsored by the Brighton Board of Trade, the Allston Board of Trade, Brighton Main Streets, and Allston Village Main Streets. A second candidates forum is scheduled for Thursday night at the Brighton Elks Lodge in Brighton Center, sponsored by the Brighton Allston Improvement Association. Hosting the Tuesday forum is state Senator Steven Tolman. While Senator Tolman has moderated such non-partisan events often in the past, he is an odd choice to do so tonight because of his direct ties to incumbent City Councilor Mark Ciommo. Not only has Senator Tolman donated to Ciommo's election campaign fund in both 2007 and 2008 ($100 each year), but he also endorsed Ciommo in the 2007 municipal election for city councilor. Earlier this year, Senator Tolman headlined the invitations for both the April 4th "Campaign Kick-Off Brunch" [right] and the June 18th "Summer Kick-Off" fundraisers for the Ciommo campaign. "It's bogus to have an obviously biased pol moderating," emailed David Bernstein of the Boston Phoenix about the situation. Bernstein, himself an occasional debate moderator who filled that role in a mayoral debate Monday night, added that a far more usual practice is to have the moderator duties performed by a journalist -- they're a dime a dozen, you know. Senator Tolman responded that the format of this candidate forum was set by the sponsors (ABOT, BBOT, AVMS, BMS), which includes a series of 16 questions -- written and selected by the sponsors alone -- that Tolman will just read at the forum; as of Monday, he had not yet seen the questions. He said that he is acting only as a "conduit of communication" in the event, and that he has done this kind of moderating many times before -- both for partisan debates (such as those run by party ward committees as part of their endorsement process) and non-partisan debates like Tuesday night's candidates forum. The president of the Allston Board of Trade, Bob Webber, said in an email message that the sponsors were unaware of Senator Tolman's endorsement of Ciommo when they asked him to moderate. The sponsors, Webber continued, were nonetheless "totally confident" in Tolman's objectivity in running the event. Challenger Benjamin Narodick said that the "situation is less than optimal," but added that he had been full aware of Senator Tolman's connections to Ciommo prior to agreeing to attend the forum. Challenger Abigail Furey, on the other hand, said that she was unaware of who the moderator would be prior to agreeing to the event. While noting her "respect" for Senator Tolman, she also expressed "disappointment" that incumbent Mark Ciommo did not recognize the presence of a conflict-of-interest and request that the sponsors select a different moderator. "This is another example of our elected officials failing to understand the concept of a conflict-of-interest, a consistent pattern that compelled me to run for District 9 City Councilor and stand up for the residents and small businesses of Allston-Brighton." Mark Ciommo and Alex Selvig did not respond to a request for comment for this article. The four candidates for Allston-Brighton District 9 City Councilor in the preliminary municipal election have sent in their campaign finance statements. Harry Mattison over at the Allston Brighton Community Blog got the ball rolling requesting the reports from the candidates. Their forms were due September 14th covering the period January 1 - September 4, 2009. All of the candidates provided their forms electronically, even though district city councilor candidates in Boston file their campaign finance forms in person with the city clerk. The candidates' generosity saved Mattison and I from having to schlep down to city hall and pay $0.20 per page for photocopies. I swear: in the next session of the state legislature I will submit a citizen's bill to have candidates for Boston district city councilor file using the online OCPF website instead of the current paper method; candidates for mayor and councilor-at-large in Boston already file electronically. It is time to end this backwards 2nd millenium practice and enter the electronic 3rd millenium. Who wants to support my bill? Nearly as much money has been spent on this campaign to-date ($75,000) as was spent at the similar point in the 2007 campaign for the open seat (nearly $78,000). That is very unusual for a race with an incumbent. Challenger Alex Selvig outspent incumbent Mark Ciommo by around 10% (approximately $36,000 vs. $33,000). Ciommo raised all his money ($35,000) from donors, while Selvig mostly self-financed his campaign with loans totally $66,500 this year. Challenger Abigail Furey split her $6,700 raised roughly equally between self-financing and donors (which was mostly through a few large donors contributing the maximum $500). Challenger Benjamin Narodick is running a bare bones campaign funded mostly out of his own wallet ($400 out of $620). Ciommo was able to increase his fund-raising by more than 40% compared to the same point two years ago. Selvig ran a relatively low-budget affair in 2007, spending only around $2,000 at this point in the campaign; this year he has spent nearly 17 times as much to date as he did in 2007. Incumbent Mark Ciommo blew away all his competitors by racking up more than 300 different contributors to his campaign. The list of donors runs as a veritable who's who of Allston-Brighton: elected officials; business owners; lawyers; activists; etc. Harry Mattison has a run-down of who some of the more illustrious names are. Alex Selvig, a candidate for District 9 City Councilor in next week's preliminary municipal election, has been spending heavily on the campaign, according to his campaign finance disclosure provided by the campaign. And he has largely been sinking his own money into the campaign to do so, too. Two years ago at the similar point in the election campaign, Selvig reported expenditures of only a little more than $2,100. This time around, he has already spent more than $35,000 -- much of it on polling ($8,500), flyers ($9,400), web design ($1,500), and "consulting" ($9,150). Challenger Selvig has even outspent the incumbent, Mark Ciommo, by around 10%, which is unusual for any campaign for elected office. Selvig's expenditures have been visible in the neighborhood through various mailings -- including one with a picture of a rat on one side. Selvig is largely self-financing his candidacy with $77,500 in loans to his committee: $11,000 in loans from his 2007 campaign carried forward, and $66,500 in new loans. He added nearly $2,000 in contributions from other people. As in 2007, Selvig wins this year's (newly-renamed) "John Corzine--Michael Huffington--Mitt Romney Award" for self-financing in an election campaign. I assume he wants to channel more Corzine than Huffington or Romney. Susan Passoni, a repeated candidate for public office, provided "in-kind" contributions to Selvig's campaign of "office furniture & supplies," valued at $350.00. Selvig makes the point on his Facebook page that his campaign office is green -- as in environmentally-friendly by reusing old office furniture. 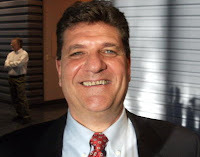 Passoni ran for the state representative seat vacated by former Speaker of the House Sal DiMasi in 2009 (Aaron Michlewitz won the seat) and for Boston District City Councilor in 2007 (Bill Linehan won the seat). By passing on the furniture to Selvig, is Passoni signaling that she's done running for elected office? Um, What Do You Mean by "Consulting"? Unlike his 2007 reports, Ciommo's 2009 report breaks down some (but not all) of the consulting charges, for example: $1811.48 on 3/6/09 to Sage-Systems (his consulting firm) for "printing and mailing"; $1,500.00 on 7/6/09 to Sage-Systems for "web-site"; etc. Selvig, on the other hand, listed a whole series of expenditures to Peter Panos of Walpole as "consulting," none of which identified the underlying purpose of the expenditure -- although, it should be noted, he lists some "graphic design," "internet," and "polling" expenditures as going to people other than Panos. I was under the impression that the Massachusetts Office for Campaign and Political Finance now frowns on campaign finance documents itemizing expenditures under the category "consulting" without further explanation. For a number of years, many candidates were apparently having their consulting firm itself pay for various expenses -- such as polling, mailers, web pages/server, etc. -- which could be hidden from view on the campaign finance reports by listing the expenditures as "consulting." Then again, this could be a distinction in reporting between the "depository" campaign accounts (state-wide offices and Boston city-wide offices) versus "non-depository" campaign accounts (Boston district councilors). Anyone know more? A link? Notes: "Own Money" includes both loans and "In-Kind" contributions paid for by the candidate. "In-Kind Contributions" from a person other than the candidate are not included in the table. Personal loans have been removed from the "Total Receipts" (Schedule A) and instead included under "Own Money". Number of contributors is for itemized contributors. It is not necessary for the campaigns to itemize contributions under $50: Ciommo and Furey itemized all contributions, Selvig has $570 in un-itemized contributions, and Narodick has $70 in un-itemized contributions. Selvig's beginning debt of $11,000 is a carry-over of a loan made in a previous election cycle; that $11,000 has not been counted in the "Own Money" column for this 2009 reporting period. ** In an email, Selvig noted that the $11,000 carry-over is active money in his campaign account, hence that he has $32,516.04 cash on-hand as of September 4th. The accounting in the table follows the way the money is listed on the cover sheets of the filed campaign finance reports. Image of "Money Grab" by Steve Wampler provided through a Creative Commons license.